Applications : When two lines are too dissimilar for a sheet bend to be relied on, use a seizing bend instead. It is ideal when using a lightweight throwing line as the messenger to haul a heavier working rope into position. It is a strong and secure bend that, having been subjected to all kinds of use, or misuse, can be easily untied. 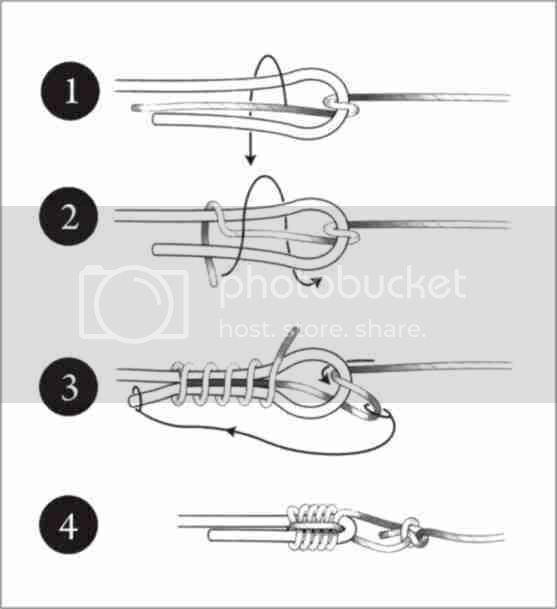 Method : Form a bight in the bigger of the two lines (1).Take a turn with the thin cord and bring the ensuing wrapping turns up towards the bight end (2).The initial turn is now extended and looped over the short end of the larger rope (3) to become a frapping (tensioning) turn holding everything in place. Even in this unfinished form the knot is secure enough for many purposes. A heavy-duty version can be made by fixing the free end to the standing part with a bowline (4).To loosen both versions, just yank up on the short working end. The part holding down the turns may now be further raised and the knot undone.